All things baked and delicious! Cookies n Cream Cupcakes! 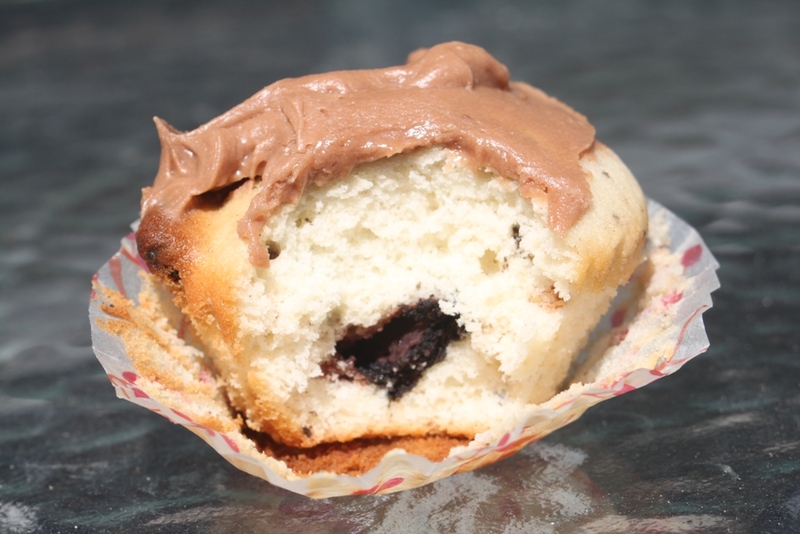 – More specifically, Oreo Cupcakes! I have Annie’s Eats to thank for my dream cupcake. Not only was it one of the only recipes that didn’t include yogurt in the batter, but the recipe used about 3 times the cookies of other recipes. Although the recipe called for about 40 cookies, I had eaten quite a few of them by the time I started baking so had about half that, which roughly works out to a pack and a half of Oreos. I also didn’t use the frosting in the recipe… Because I had used up (see: eaten) all the Oreos. 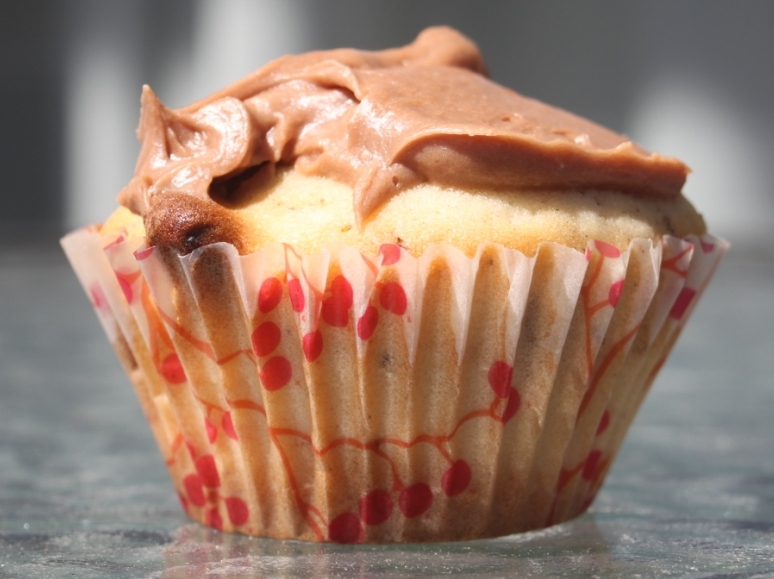 Instead I found this nifty little frosting recipe that goes perfect with these cupcakes. It also uses sour cream which i thought was a bit different and added a little bit of tartness to an otherwise extremely sweet cupcake (not that i’m complaining). Ultimately I was pretty happy with these cupcakes. My only minor complaint (and no doubt this is my baking prowess rather than the recipe) is that they seem a teeny bit dry. If anyone bakes these and finds the same thing, let me know. Otherwise I will assume it’s me. Regardless, I still ate 5 of them… in one morning… one after the other. I had to give at least 10 of them away because I feared the repercussions of eating 24 cupcakes all by myself. So now i’ve found a recipe for Champagne Cupcakes which look absolutely amazing. I have to try it out… I can hear the recipe calling me… Watch this space. I impressed myself the other day by making what can only be described as THE best muesli/granola Earth has ever seen. This might seem a tad presumptuous and i’m sure there are plenty of delicious muesli and granola recipes but I am telling you, this was goooood. Heat your oven to 150 degrees celsius (300 degrees fahrenheit). Prepare a large baking tray with non-stick baking paper. Mix together the oats, coconut, almonds, sea salt, cinnamon, brown sugar, dates, apricots and cashews in a big bowl. In a saucepan, combine the honey, oil and white sugar and heat until simmering. Be careful with this because the ingredients swell (kinda like when you make hokey pokey). Remove from the heat and stir in the vanilla. Pour the liquid mixture over the dry ingredients. When it has cooled a little (just enough so you don’t burn yourself!) mix together all the ingredients with your hands to cover all the dry ingredients with the liquid. Spread the mixture out on the baking sheet. Spread this as evenly as you can, unless you like your muesli a bit chunky which is also delicious in my opinion. Bake until golden brown or about 25-30 minutes, stirring regularly (you’ll smell it and instantly KNOW it’s ready). A word of warning – if you’re using a gas oven this tends to be ready after about 20 minutes. The muesli will be HOT, HOT, HOT when you take it out of the oven so don’t do what I did and pop some in your mouth straight away (it’s hard to resist…). Transfer the muesli to a rack and let it cool completely. Once the muesli is cool transfer it to a airtight jar and munch away! This is delicious with greek yoghurt or as a crumble over stewed fruit. Or just do what I do and eat it by the handfuls! Now i’m off to try and make the Best Cookies n Cream Cake Ever Made… Wish me luck! Sign me up for Bakesaurus news!